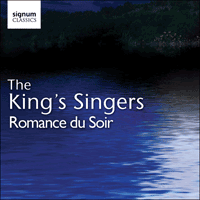 Combining perennial favourites with wonderful new discoveries, these immediately appealing pieces reflect the much-loved repertoire at the heart of a King’s Singers programme, performed with the skill and flair that distinguishes the group as one of the world’s most popular a cappella ensembles. Includes works by Elgar, Schumann, Schubert and Saint-Saëns, as well as a new piece by popular American composer Libby Larsen. By the time Elgar wrote his partsong O happy eyes in 1889, fresh ideas about devising concert programmes had taken firm root in the minds of composers, their publishers and audiences. Lofty works from the past, or original pieces inspired by them, were now parcelled together with new compositions, the resulting package tacitly recognised as ‘classical music’. The gap between ‘serious’ and ‘light’ music, meanwhile, continued to widen. Many of the pieces in this programme, those by Elgar, Sullivan, Bairstow and Saint-Saëns expressively eloquent among them, occupied border territories between the high classics and the immediately popular. All of them speak directly to audiences, whether of romantic love, love unrequited, the pain of separation or the imaginary landscapes of evening and the night. Five years before O happy eyes entered the world, one of Elgar’s early pieces, Sevillana, was included on the bill for a concert by the ‘orchestral band’ of the Crystal Palace. It stood in company with a waltz by the junior Johann Strauss, a solo by the fashionable south London venue’s resident cornet virtuoso, and Louis Gregh’s tuneful Coquetterie. Elgar, no doubt propelled by the accolade of a Crystal Palace performance, received a further confidence boost when one of his piano pupils accepted his proposal of marriage. Caroline Alice Roberts, daughter of major-general Sir Henry Gee Roberts, known for his part in the ‘effective’ suppression of the Indian Mutiny, inhabited what one biographer has described as a ‘world of letters’. It was also a world of privilege and rigid class distinctions, one to which Elgar, the Roman Catholic son of a shopkeeper was naturally excluded. The couple married, against Roberts family wishes, in May 1889. As part of their marital union, Elgar set Alice’s poem, O happy eyes in November, revising his partsong in 1894 when the publishing firm of Novello offered three guineas for its copyright. It finally appeared in print in 1907, issued together with Love, a fine setting of Arthur Maquarie’s poem written on the composer’s fiftieth birthday and dedicated to Alice, by now Lady Elgar. ‘I am so glad for Mother’s sake that Father has been knighted,’ the Elgars’ daughter, Carice, is said to have noted. ‘You see—it puts her back where she was.’ Love reflects the blend of craftsmanship and inspiration that had placed Elgar at the summit of Edwardian musical life: both qualities emerge in his treatment of Maquarie’s line ‘Cease to be’, repeated four times in the bass line and richly decorated in the tenor part’s flowing melody. Few poems have been set with such frequency or variable results in the great repertory of English partsong as Percy Bysshe Shelley’s Music, when soft voices die. Edward Bairstow’s version, for two tenor and two bass parts, is a miniature masterpiece of the partsong genre. The piece, published by Hawkes & Sons in 1929, elevates the virtue of textural simplicity in setting evocative, beautifully turned poetry to music. It also underlines Bairstow’s innate feeling for harmonic colour and its affective powers: listen, for example, to the striking initial chordal shift and subsequent use of unprepared dissonance for ‘Odours, when sweet violets sicken’. While the combination of Chorley and Sullivan may not resonate widely today, it counted for much before the more familiar partnership of Gilbert and Sullivan took hold in the 1870s. Henry Fothergill Chorley, undeniably influential as a music critic and relentlessly ineffectual as a novelist and opera librettist, supplied the words for Arthur Sullivan’s Kenilworth in 1864. Although their next venture, an opera originally entitled The sapphire necklace, was never performed, Chorley and Sullivan scored one of the most enduring hits of the Victorian partsong literature following the 1868 publication of The long day closes. The work’s rich harmonic palette, its sonorous scoring for male voices and contemplative reflection on death’s hour satisfied both the market demand for popular secular choral compositions and prevailing vogue for decorous expressions of mourning and grief. Dictionary definitions of the term partsong generally stress its Anglo-Saxon roots and evolution as a catchall description of short, unaccompanied pieces for choral voices, including everything from 17th and 18th century glees and catches to Arthur Sullivan’s Five Sacred Partsongs of 1871. The rise of the 19th choral society movement, coupled with a revival of interest in music of the past, led to the creation of partsongs by the thousand, many of them styled as ‘madrigals’. Camille Saint-Saëns’ output of secular partsongs fuelled demand from male voice choral societies, the so-called Orphéons, which regularly gathered to compete in festivals held throughout France. His Sérénade d’hiver, written for choir of four male voice parts in 1867 and published the following year, provided ‘Orphéonistes’ with a delightful showpiece, one that revels in the playful assonance and suggestive lines in Henri Cazalis’ poem. It’s hard to credit that the masked chorus singing so lustily here beneath a lady’s window is solely populated with ‘gentle men, Full of honour and courtesy’! Calme des nuits was published in 1883 as the first of a pair of choruses, its sustained lines, spare textures and stirring emotional gear-shift at ‘L’éclat du soleil’ demanding much of the amateur choirs for which it was intended. The Romance du soir, composed for mixed chorus in 1902 to a text by Jean-Louis Croze, recalls a gentler age disturbed only by heavenly sounds of the ‘evening romance’ and ‘happy children’. Germany’s tradition of romantic partsongs effectively began on 24 January 1809 when Karl Friedrich Zelter, director of Berlin’s Singakademie, convened his first ‘Liedertafel’. The first gathering—of 25 poets, composers and singers—developed into a regular event, at which new and occasionally ancient partsongs were performed over dinner. Other singing societies (less exclusive than Zelter’s although generally still limited to men only) soon came to life, part of a wider cultural network that helped form and spread ideas of German national identity in the decades before and after the revolutionary year of 1848. Schubert was naturally drawn to what one scholar has described as the ‘gregarious music-making’ of partsongs. His Liebe, a setting for two tenors and two basses of verses from Friedrich Schiller’s affective hymn Der Triumph der Liebe, distills the essence of romantic love. Within a song of short span and wistful tranquility, the composer vividly intensifies ‘das Ach!’, the ‘alas’ of ‘mournful nightingales’. The work, complete with optional piano or guitar accompaniment, first appeared in one of three sets of Schubert male-voice partsongs published in 1823. Simplicity is key to both Johannes Brahms’s Waldesnacht, the third of seven Lieder for mixed amateur choir, and Richard Strauss’s male-voice chorus Traumlicht. There is great deal of the chorale about Waldesnacht, with its repeated verses and solid opening. Yet Brahms subverts the work’s hymn-like tread by introducing rhythmic variety in the shape of syncopations and an unexpected moment of silence to its middle section. Traumlicht represents a genuine late flowering of the Liedertafel movement, created in 1935 at a time when so many German choirs were adopting new songs of nationalist aggression and Nazi ideology. Here, Strauss initially echoes the classic close-harmony sound of the Männergesangverein (‘Male song association’) before adding a noble richness of texture and expressive nuance to his composition. It’s practically impossible to resist a song dedicated to ‘dearest little Elsie of my heart’! If the lyrics of Ludwig Senfl’s Ach Elslein, liebes Elselein mein fail to hit the spot, then his plangent music almost certainly will. Martin Luther considered the Basel-born composer as being ‘gifted and graced by God with the art of music’, a view of Senfl apparently shared by such illustrious employers as Emperor Maximilian I and Duke William IV of Bavaria. Ach Elslein was one of 121 new songs by ‘famous’ composers published in Nuremburg in 1534 by Hans Ott under imperial privilege. Orlande de Lassus, born in the Franco-Flemish city of Mons in the early 1530s, achieved international fame as maestro di cappella at the Bavarian court, which he served from 1556 until his death thirty-eight years later. Despite his long tenure in Munich, Lassus, as the American musicologist James Haar neatly puts it, ‘never entirely let off being a Frenchman’. He wrote around 150 chansons, mostly published in the Netherlands and Paris and widely reprinted elsewhere. The five-part Toutes les nuitz, published in Rome in 1563, matches the elegance and subtle stresses of Clément Marot’s tender love poetry. Beyond sighting the evidence of a tiny metal plaque, visitors to Colchester could easily pass through the ancient town without discovering that it was home to one of England’s greatest madrigalists. John Wilbye, a musician in service to the Catholic Kytson family, spent the final decade of his life in the ‘great brick house’ of Lady Rivers, opposite the Colchester churchyard where it is believed he lies buried. Weep, weep mine eyes and the peerless Draw on sweet night were both published in London in 1609, part of an all-Wilbye collection offered for sale as ‘The Second Set of Madrigals…apt both for Viols and Voices’. The emotional range of Draw on sweet night, conditioned by its two clear shifts from major to minor mode and carefully ordered melodic repetitions, fully reflects the wistful melancholia of Wilbye’s verse. It was a joy to record this album of immediately appealing, wonderful music, plugging the gap between our recent serious and light recordings. Much of the repertoire has been in the group’s library for some time and we were keen to record these golden oldies alongside brand new discoveries. The concept for this album grew from these two opposing ends. The starting point was the ever popular Sérénade d’hiver, a charming piece which delights audiences wherever we sing it. Looking at the rest of Saint-Saëns’ repertoire we found the piece which gives the album its title, Romance du soir, a quartet, but a remarkably lush one. Next came English music from Elgar, whose feelings for love went far beyond the reputation of most buttoned-up Edwardian gentlemen, and this was followed by pieces by some of the great Romantic German composers—Brahms, Schubert and Schumann. Our concerts most often provide a variety of sounds, colours and textures and this idea has filtered through onto CD with a few Renaissance pieces amongst the 19th and early 20th century music. What a wonderful excuse, then, to record the two outstanding madrigals by Wilbye, Draw on sweet night, and Weep, weep mine eyes! Completing the programme we turned to the music of the American Libby Larsen, whose understanding and grasp of choral writing shines through in A lover’s journey, which she wrote for us in 2001.